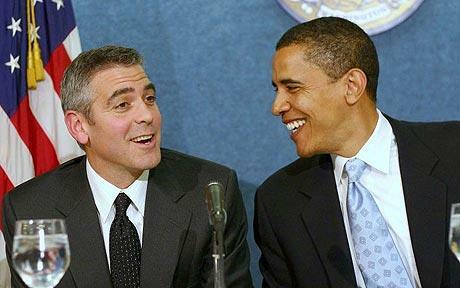 Heading For Dinner with the Prez and Clooney…What Did You Do Today? Based on an actual email I got, my imaginary conversation with the President of the United States (still Obama for those keeping track). ME: OK…aren’t there other things you might spend your time on? Besides, I’ve been there. Really nothing special. Your house is nicer actually. BO: …and two grassroots supporters and their guests will join us. ME: Sounds like a great time. Ask him why he left ER. I really thought it was too soon. His acting career could have really taken off! ME: Who should I take? Wow, this really came as a surprise! Thanks B. I’ll ask around. BO: — or somebody else and theirs. ME: Dude! Uncool! I said I’d look! You’re kinda impatient. BO: So let’s nail it down: Any donation you make today will automatically enter you and a guest to win. ME: Really? You want me to pay? You just about invited me. I’ll bring the wine instead. How’s that? And what’s this about winning? BO: Once you decide who you’re inviting to join you, we’ll be all set. ME: Alright…I think. Does that mean the offer is still on? I think I found someone to go. What else do you need? BO: The campaign will take care of your airfare and hotel for you. ME: That’s awfully nice of you. Let me at least pitch in for the hotel. ME: $3? Seriously, you keep the money. I’ll find a place that isn’t rented by the hour. BO: … and keep your May 10th clear. ME: It’s clear! See you May 10th! BO: Hope to see you soon. ME: Yeah, like I said, May 10th. Don’t get all suffocating now. Posted on April 24, 2012, in $3, Barack Obama, George Clooney, Imaginary Dinner, Musings and tagged Barack Obama, Dinner, George Clooney, President. Bookmark the permalink. 1 Comment. And all along I thought you were close enough buds to call him Barry.